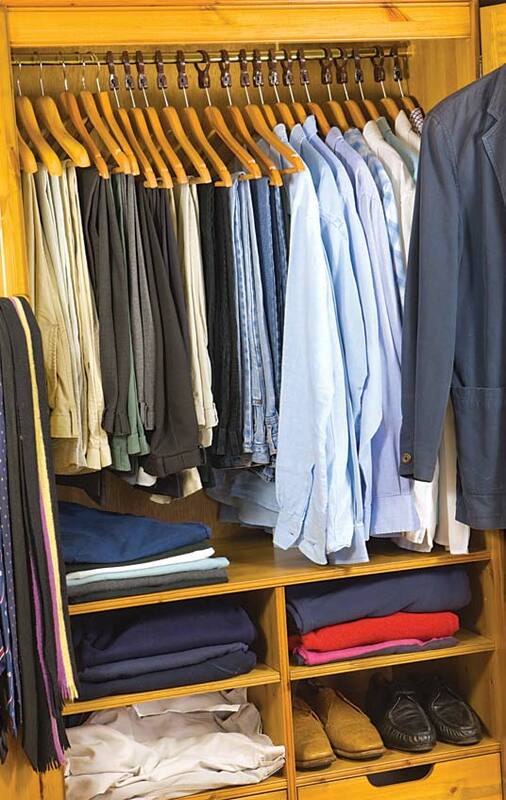 Here are some simple solutions for dealing with your loved one’s dressing and wardrobe needs. Picture a woman who is a serious clotheshorse. She spends a great deal of time building her wardrobe, finding just the right pieces. She then carefully plans out each day’s outfit, matching different looks and colors for optimal stylish impact. These day-to-day experiences with clothing and accessories are positive, even enjoyable for her. Now imagine this same woman several decades later. She has Alzheimer’s disease, and opening the door to a closet full of clothing—an activity she once found pleasurable— fills her with anxiety. The vast number of choices makes selecting an outfit overwhelming. And once she does manage to stumble upon a suitable article or two, dressing presents an entirely new set of challenges. Her daughter, who is also her caregiver, is equally exasperated by the experience. shirts, pants with pants, etc.—is a helpful way to assist your loved one. Organization is an important first step. If your loved one is still in the early stage of Alzheimer’s disease, you should allow him or her to select daily outfits. This action can promote self-esteem and allow the person with dementia to still feel a sense of control over his or her own life. As the disease progresses, wardrobe selection can become more overwhelming. You can help reduce the confusion associated with this task with a good spring-cleaning of your loved one’s closet and drawers. Your first step in the process should be to remove any unnecessary clothing. In the beginning, go ahead and get rid of anything your loved one no longer wears. You can pare down the clothing selection even further by keeping off-season clothing in a different closet. 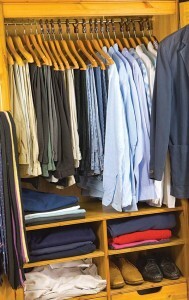 As you organize, it’s also helpful to categorize items— shirts with shirts, pants with pants, and so on. A helpful way to assist your loved one in remembering which drawers to use is to cut out a magazine or catalog picture of certain categories of clothing and then tape those pictures to the corresponding drawers. For example, tape a picture of a nightgown to a drawer containing sleepwear. Once the Alzheimer’s disease has reached a moderate stage, you will want to limit your loved one’s choices even further, and eventually get more involved in helping him or her select clothing. Perhaps at this point, you can lay out two outfits for your loved one each day, and then let him or her choose what to wear from that small selection. According to Barnet, this will still allow your loved one some autonomy, while making the decision process easier and less stressful. When it comes to advanced Alzheimer’s disease, it might be wise to limit your loved one’s clothing choices altogether. Removing most or all of the stored clothing from the dressers and closets in his or her immediate living area may be a necessary step to prevent confusion and distress. • Look for shirts, sweaters and jackets with Velcro fasteners. If you are unable to find any, you can add the fasteners to existing clothing items (or have a tailor or seamstress do so). • Choose clothing that is loose-fitting and stretchable. • Ensure that socks are snug, but not tight, and of the “no-skid” variety. • Buy non-slip shoes that don’t have laces. • Stock up on duplicates of wardrobe items your loved one likes to wear repeatedly. • Lean toward durable fabrics, and avoid clothing with special washing requirements. • Consider clothing that fastens in the back if your loved one has a problem with repeated disrobing. • Don’t forget other specific doctor-recommended clothing—such as circulation-enhancing socks or diabetic shoes—your loved one may need. Tops, such as a cape, that fasten in the front and are loose-fitting are ideal for Alzheimer’s patients. Barnet suggests you also consider easy-to-remove layers. Items like a shawl or a cape can provide warmth, when needed, but can also be removed easily if your loved one gets overheated. “These kinds of garments are ideal because there are no arm holes to deal with,” she points out. When purchasing specialty items, such as a bath cape, it can be helpful to shop with a company that specializes in clothing for people with Alzheimer’s disease. For a caregiver, dressing a loved one with dementia can be a dreaded event. It’s often physically demanding. And, as with any interaction with a person with dementia, it can be mentally exhausting. 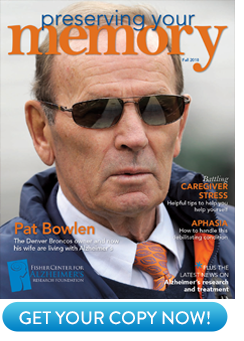 In the early stage of Alzheimer’s disease, your loved one may be able to dress him or herself—with supervision. You can provide assistance, but allow as much independence as you can during the dressing process. As the disease progress, however, you’ll need to get more involved. • Do establish a routine by having dressing occur at the same time each day. • Do lay your loved one’s clothing out in the order the clothes will be put on. • Do always respect your loved one’s modesty and dignity when you’re assisting with dressing. • Do compliment your loved one on how good he or she looks. Everyone wants to look and feel good. • Don’t take over if your loved one is able to dress him or herself, no matter how long it takes. • Don’t rush the process. Doing so will only create stress for both of you. • Don’t fuss over details like mismatched clothing. With Alzheimer’s disease, dressing is usually the first daily challenge of many. Approaching this activity with the right attitude and techniques can help set the tone for the entire day.